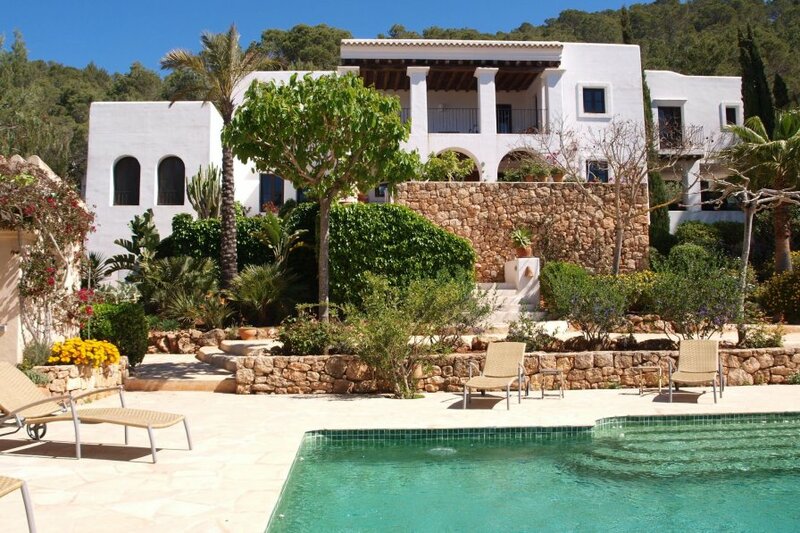 San Carlos is a large, splendid Finca style country house. The house was built with great attention to detail and lovingly furnished. It is suitable for 8 persons. The house has a wonderful atmosphere and you will feel at home immediately. It is in a quiet country area on a hill near San Carlos. There are delightful views of the valley and the sea. There is a large covered terrace with a table and rattan chairs in front of the house. A small terrace is on a lower level. The well landscaped garden has mature trees, mimosa, palms and acacias. The (10 x 5 m) swimming pool has a natural stone sun terrace. There is a covered terrace with barbecue, outdoor kitchen and dining table. You are only a few minutes by car from San Carlos and the attractive beaches of Cala Leña, Cala Boix and Agua Blanca. Santa Eulalia, with its many shops and restaurants, is around 10 minutes away by car. The fine traditional entrance leads to the hall which has a guest toilet with shower. The spacious dining room has a beautiful, high (4m) beamed ceiling and an open fireplace. It has a large table and chairs. French windows open onto the covered terrace. The lounge has a stylish, comfortable seating area and an open fireplace. Stairs lead from the dining room to a television area. There is a double bedroom and a twin bedroom in the wing of the house. There is an attractive, large bathroom between the two bedrooms with double wash basin, semi-circular bath, shower and toilet. The kitchen is in Provencal style. It is well equipped with large fridge, cooker with oven and a dishwasher. The utility room has a washing machine and an extra freezer. Stairs lead from the hall to two double bedrooms with air conditioning and a shared bathroom. All bedrooms are decorated with wall paintings.